The 'Hereford, Ross and Gloucester Railway' built the line due to an Act of Parliament being passed in 1851. The first section of the Hereford-Ross-Gloucester Railway was opened on 11th July 1853 and ran from Grange Court, which was the junction with the South Wales line, to a temporary station and engine depot at Hopesbrook (or Hopeswood) near the eastern end of the Lea tunnel. There was slow progress building the 771-yard Lea Tunnel and this delayed completion line. It was built for broad gauge and the single track bore was the most significant structure on the section to Ross. This also marked its highest point on the line. Passengers, who could have originally boarded at Paddington where the trains originated, had to continue their journey by bus to Ross. It was a further two years before the Hereford, Ross and Gloucester Company completed the construction of the tunnels, bridges and viaducts from Hopesbrook to Hereford. 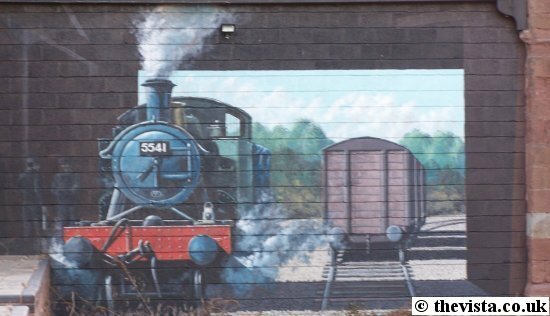 The stretch from Hopesbrook to Hereford was opened on Friday 1st June 1855 and the first trains arriving were decked out with flags and the Goods Shed at Ross was used to hold a celebratory tea party for 2000 local children. HEREFORD, ROSS AND GLOUCESTER RAILWAY. At length we have the satisfaction to record the opening of this line Railway, which took place on the 1st day of June last, with great rejoicings. On a Rocky eminence looking over the Wye stands the town of Ross. Nothing can be more picturesque than its position from the Railway. We should add that the opening of this line of railway gives the tourist cheap and easy access to the tour of one of the finest rivers in Europe. The Wye tour, considered not to be excelled by any in Switzerland, can, by means of this railway, be accomplished in less than two days; and, by by an excursion-train of Great Western, there is not a mechanic in London who may not enjoy, at the cost of one day`s labour and three days` wages, a treat hitherto only within reach of the wealthy. This meant that Ross was able to cater for an even wider range of the population thus increasing the status of the town. 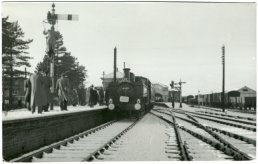 After the completion and opening of the complete line, the temporary depot at Hopebrook were closed and Ross became the principle station. As it was a single track the trains had to pass on the loop at Ross. Being as the line was not seen as a prosperous one, the land originally purchased to allow the line to be converted to a double track was never used5. From the beginning the line was worked by the Great Western Railway (GWR) and in 1862 the Hereford-Ross-Gloucester Company was absorbed by the GWR. 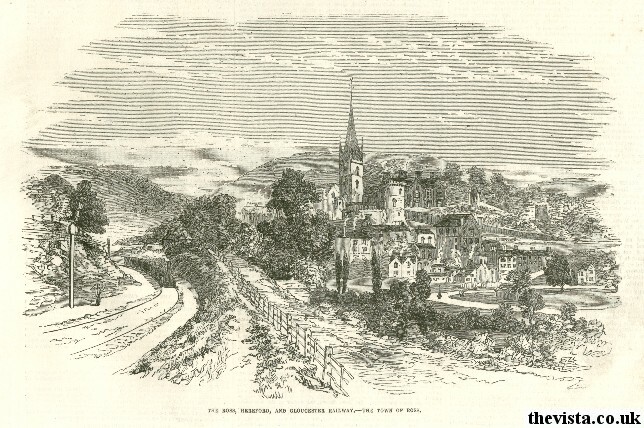 A further Act was passed in 1856, allowing a rail link from Ross to Tewkesbury although this was never built. This did lead to the 10 mile Monmouth to Ross line that passed through Walford, Goodrich, Lydbrook and Symonds Yat. This was opened to passengers on 4th August 1873. James Wallace Richard Hall, who was from Springfields, was a local solicitor and banker and a major player in the creation of the Hereford, Ross and Gloucester Railway Company. He started out as a solicitor to the company and then later became a director. 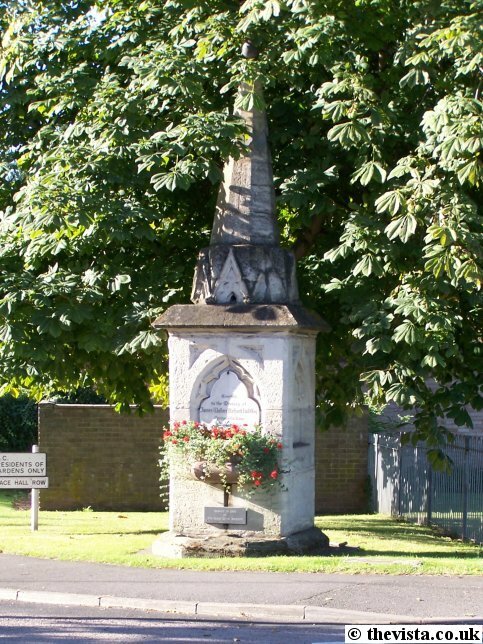 He died suddenly in 1860 and local donations were used to erect a fountain in his memory. 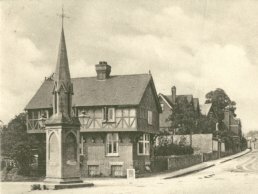 Part of the fountain is currently located on the corner of Smallbrook Road and 'Station Approach'. 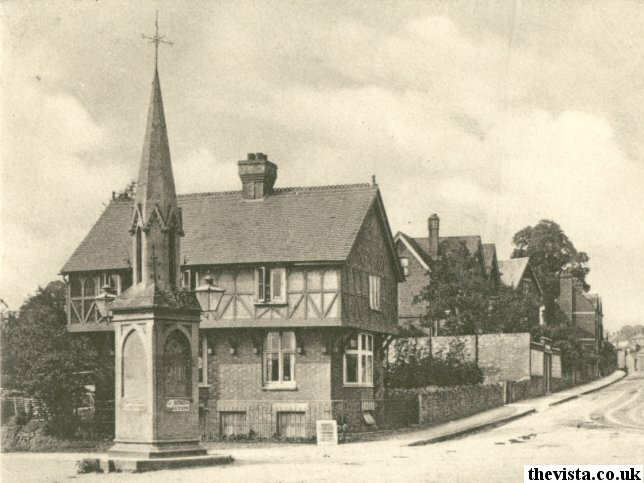 It was originally located on the junction of Cantilupe Road, Smallbrook Road and Station Street close to where the roundabout is today but had to be moved to allow improved access to the Ashburton Industrial Estate. Ross-on-Wye Civic Society helped to raise funds to move and rebuild it in 1992. In 1863 Great Western Railway took over the running of the line. In 1869 the entire South Wales Railway and the Great Western's main line from Exeter to Truro was broad gauge. The Great Western was determined to change this and do a full conversion by closing up the 7 foot 1/4 inches rails so that they measured 4 foot 8-1/2 inches rather than adding a third rail to "mix" the gauges. This meant that tests were needed to prove the viability of this. This meant that an experimental conversion was made between Grange Court and Hereford. The twenty-two and a half miles stretch was far from easy to convert. It included short tunnels, sharp curves and difficult gradients. This meant three hundred plate-layers were given seven working days to complete the task. The experiment was highly successful. Valuable information was gained by the GWR engineers about how future large-scale conversions could be carried out. This brought the realization that every detail possible should be planned and prepared in advance and that the men could not be divided into gangs shifting on as a section was converted because the whole line needed to be tackled simultaneously. The Hereford to Gloucester line was then fully converted later that year. 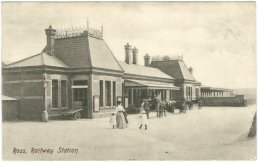 The first Station building was replaced by the main Station building which was opened in 1890. This was designed by J. E. Danks of the G.W.R Civil Engineer's Department in Paddington. 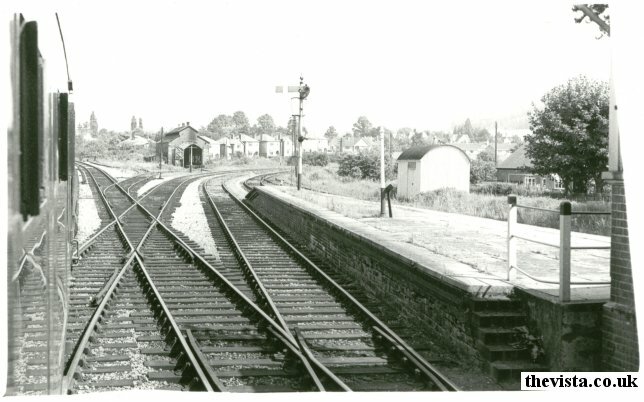 Here we can see both the North and South Signal Boxes, the engine shed, the goods shed and the station. This is an extract from a GWR half-day excursions timetable for June 1937 from Barry and Penarth Districts. 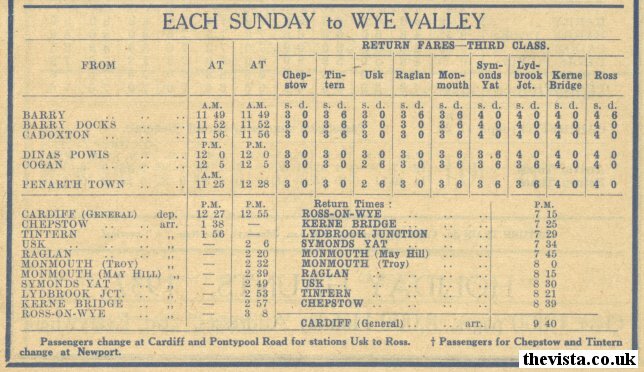 It shows the Third Class return fairs and timetable from the South Wales area up the Wye Valley line to Ross-on-Wye. 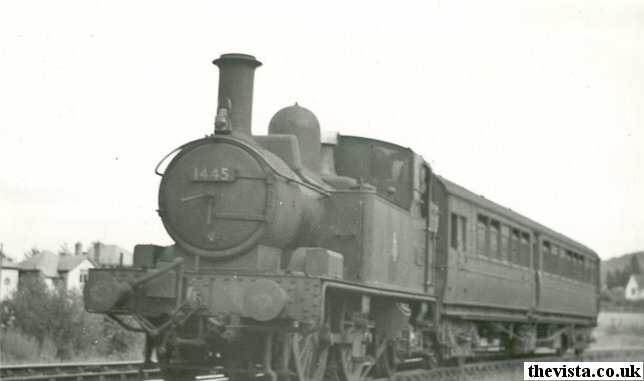 This is a scan of a photo of Collett '14xx' class 0-4-2T engine, number 1445, with two carriages as it approaches Ross-on-Wye station from Monmouth. In the background can be seen houses at Hildersley that were just outside the station. 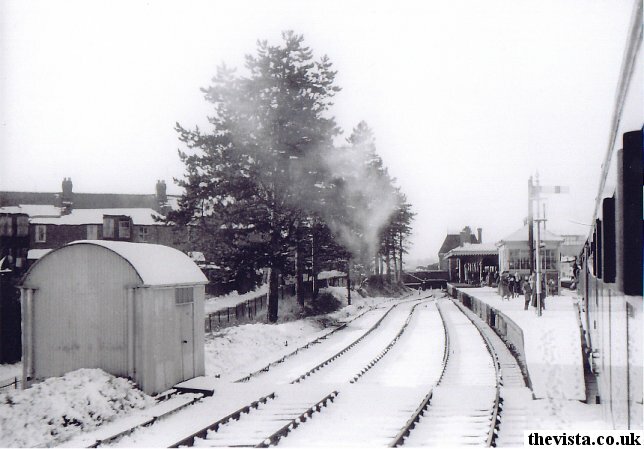 Here we see a photo taken off a train as it sits in Ross Station after it has been snowing. This shows the back of the station with the main station building in the background and the West Signal Box can be seen in the foreground, dating the photo to sometime after 1938 when that box was added. Many people can be seen on the platform and hanging out of the doors of the train. I believe this train would have been coming from or going towards Monmouth on the Ross to Monmouth line thus the photo was taken pre-1959 which was when the last passenger train ran. me to use a copy of this photo. The road, spearhead fencing and trees to the centre and left of the photo are still there today but none of the station buildings themselves remain and this area is now part of the Ashburton Industrial Estate. The trees, now much larger, have recently had a preservation order put on them because there was a plan to cut them down, but after some petitioning and effort by the people living in the locality, they have been saved. Here we see the view back towards Hildersley. 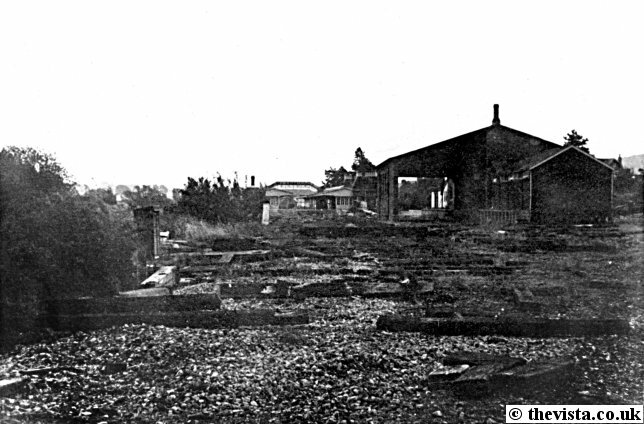 In the background can be seen the houses at Hildersley, with the engine shed in the middle and the loading dock or platform in the foreground. This is a photographic view of the south platform as a train pulls into the station and people wait to board it. The layout of the station is quite clear. The bridge between the platforms can be clearly seen as can the various waiting rooms for the different passenger classes with the main station building behind. 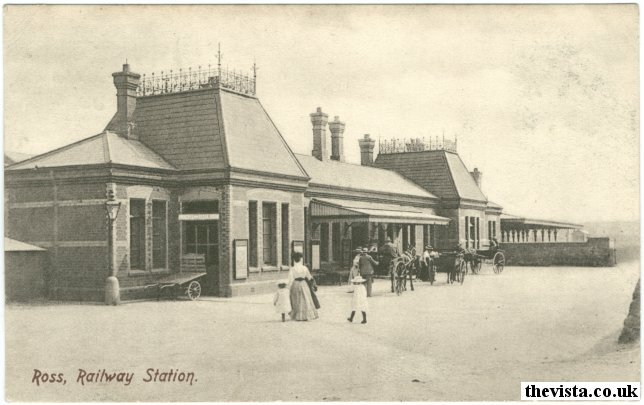 Above are postcard and photograph views of the outside of Ross Railway Station. 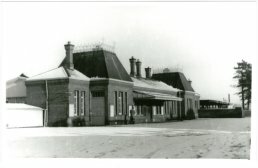 The main station building in Ross was of a similar design to the one in the photo below. 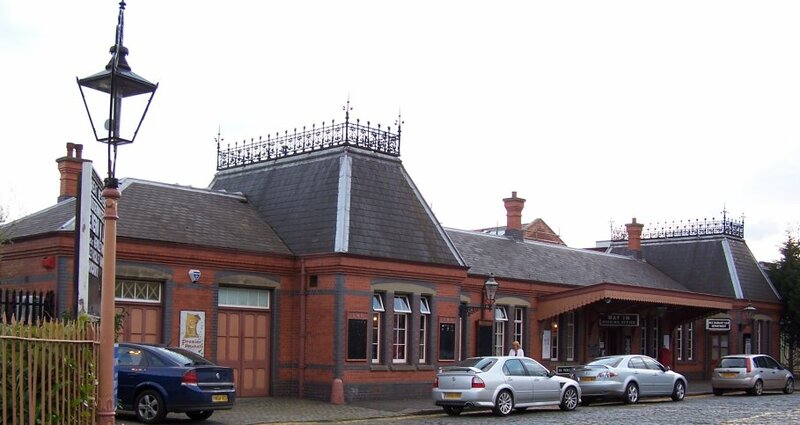 The station below can be found at Kidderminster on the Severn Valley Railway line. Increasing car ownership meant that people were choosing not to use the railway so it became redundant. This was well before the Beeching Report caused the closure of the majority of the smaller lines. This marked the beginning of the end for the railway through Ross. 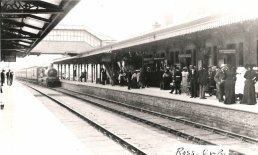 This meant that on the 4th January 1959, the last passenger train from Monmouth arrived in Ross and the line was officially closed on 5th January 1959. As a direct result of the Beeching Report, on the 31st October 1964, the last trains left Ross for Hereford, on the Ross-on-Wye to Rotherwas Junction section, and the section was officially closed on the 2nd November 1964. 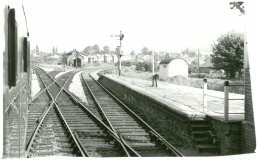 The Ross-on-Wye to Gloucester line, the Ross-on-Wye to Grange Court section, was finally closed on the 1st November 1965 and the Ross to Monmouth line, the Ross-on-Wye to Lydbrook Junction section, was also closed on the 1st November 1965. Here we see a photo, although not particularly clear, of the station area after the rails were removed. In the foreground are the sleepers and to the right is the goods shed. In the distance is the station and bridge between the platforms. 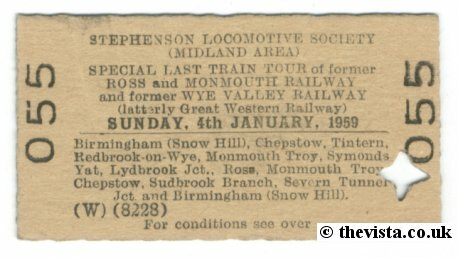 The last passenger train to run the Ross to Monmouth section was a "closure special" (ticket no. 55 can be seen to the right) on 4th of January 1959 and was put on by the Stephenson Locomotive Society. It ran from Chepstow to Ross-on-Wye via Monmouth and is believed to have been the only train to have ever run this route in a single journey. The special was hauled by 6412 and 6439, which were a pair of 0-6-0 pannier tanks number 6439 and 6412. Since then, 6439 has been broken up for scrap but 6412 is operating on the West Somerset Railway. To the left is a photo showing 6439 pulling the last train in Ross Station.